East of Big Bend National Park lies a large area of desert, devoid of roads or any major natural features; there are 100 miles of emptiness between the park boundary and Langtry, the next place where the Rio Grande is reached by a paved road. 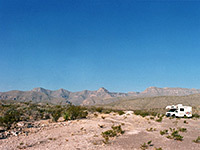 A small part of this region adjoining Big Bend is set aside as the Black Gap Wildlife Management Area, which occupies 100,000 acres including about 30 miles of the riverside, with the twin, rather conflicting aims of providing a location for wildlife study and a regulated hunting area - principally for javelina, deer and some gamebirds. The only access is along farm road 2627 which this leaves US 385, the eastern approach to the national park, shortly before the Persimmon Gap then follows beneath the northwest face of the Santiago Mountains for 26 miles to the Rio Grande, ending at a fenced-off bridge over the river into Mexico. The road drops over 1,000 feet through rocky, undulating desert land densely covered with many types of cactus. In summer the temperature difference seems quite marked - the relatively cool and often breezy conditions around the main road are replaced by stifling windless heat and temperatures up to 110 °F at roads end. The land is unspoilt wilderness and is little visited. In summer only a few cars drive along the road each day, and even these are more likely to be en route to a guest ranch beside the river rather than exploring the desert. There are many places for camping by the road, or along side tracks leading into the wilderness. Two main 4WD dirt roads lead into the hilly eastern area of the WMA - both follow the course of streams and eventually reach the Rio Grande after passing through side ravines (Horse Canyon and the longer Maravillas Canyon).